I used to say "oh my aching feet" but not any more. I finally found the ideal waterproof boat shoe that provides comfort and support in the boat all day long. You can trust me when I say that doing literally thousands of fishing trips has given me an opportunity to run the gambit of boat shoes, moccasins, boots and sandals. At one time or another, I’ve come awful close to thinking that I had found the best shoes for the job. The problem is that in most cases, boots that kept me dry were either too clunky for the boat, too hot or didn’t provide enough arch and ankle support to keep my feet healthy. Moccasins are okay in warm weather, but they are sorely lacking when it comes to arch support and are way too cold for spring and fall in Minnesota. Tennis shoes, fairly comfortable, but are almost always wet because they provide no protection from rain or at the landing while loading the boat. So, it’s always been "close but no cigar" when it came to the search for ideal fishing footwear until now. This time I have really stumbled into a better mousetrap. 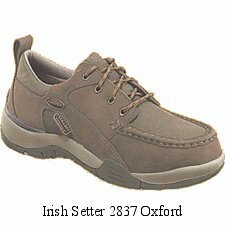 Irish Setter has come out with a line of boating shoes they call the "Pro Angler". I’ve been wearing the model 2838, which is a Chukka style shoe with great ankle support. It also comes in a lower cut, Oxford style model 2837 that I’m looking forward to wearing during the warm summer months. Folks who understand the northern climate designed this line of footwear. So, they’ve incorporated features that are important Midwesterners and the combination is unique. Waterproof construction is important to me and these shoes have been dry every day, even when I’ve been in standing water at the boat ramps. They even have a waterproof guarantee for a year! The soles are smooth, non-slip and non-marring material that really helps cut down on damage to the boat caused by tracking in sand and mud from the shoreline and they provide a much more sure-footed sensation when moving around in the boat. For me, the best feature has been the great arch support, which has been sorely lacking in most other moccasins and rubber bottom type boots I’ve worn in the past. The perfect boat shoe? If you fish in the Northern region where warm, waterproof and comfortable shoes are a must, these just might be the ones you've been looking for. For me, they've been head and shoulders above the others that I've tried. 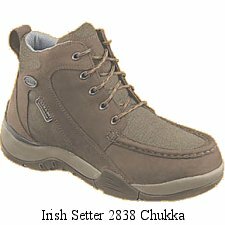 Click on the pictures for a quick link to the Irish Setter website for more information about these.